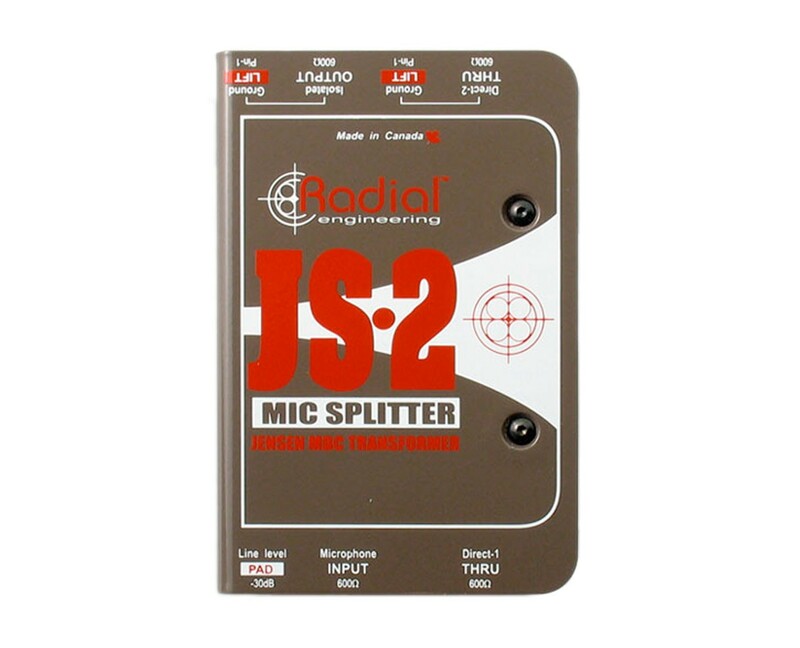 The Radial JS2 is a high performance balanced mic level splitter that lets you split a signal and feed multiple destinations at the same time. Typical applications include splitting a signal in the studio to feed more than one preamp, feeding a stage mic to more than one mixing console, or even splitting the signal to a live PA during a broadcast event. The JS2 is equipped with one isolated output. The engine inside is a premium Jensen transformer. It features a nickel laminated core for exceptionally low harmonic distortion without the usual phase shift and limited bandwidth typically introduced by lesser designs. The JS2 deliver better than 90dB of noise rejection, eliminating troublesome noise caused by stray DC voltage and hum & buzz caused by ground loops. The signal path is 100% discrete and incorporates RF filtering for even greater noise suppression. These 'problem-solvers' offer a simple yet highly effective interface for microphones or direct boxes, and by engaging the built-in -30dB pad, consumer and line level devices may also be connected without distortion or fear of overload due to saturation. As with all Radial products, mic splitters feature rugged 14-gauge steel construction for maximum durability. A unique book-end design creates a protective zone for switches and connectors against the harsh environment of concert touring while the internal I-beam frame makes it virtually impossible to torque the PC board which could otherwise compromise the sensitive solder joints. The innovative design also has the unique advantage of allowing up to 8 units to be rack-mounted using the Radial J-Rak. The Radial JS2... splits the mic signal without compromising your sound.